Jimmie Ruth Strickland Bradford, 82, went to be with her heavenly father on Saturday, January 19, 2019, after battling Alzheimer’s Disease. Jimmie was born to the late James B. and Mary Catherine Strickland on August 13, 1936, in Furman, Alabama. A celebration of Jimmie S. Bradford’s extraordinary life will be on Saturday, January 26, 2019, at 10:00 a.m. in Camden, Alabama, at the Dunklin Daniels Funeral Home, 63 Camden Bypass, Camden, Alabama 36726, followed by burial at the Kelly Cemetery in Pine Hill, Alabama. A light lunch reception from 12:30 – 2:00 p.m. will be at the Gaines Ridge Dinner Club, 933 Highway 10 East, Camden, Alabama 36726. 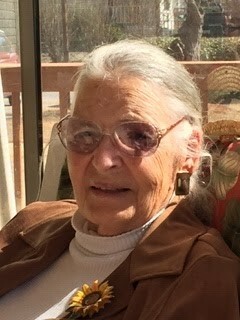 Mrs. Bradford is survived by her husband of 64 years, William Clifford Bradford; two daughters, Sharon B. Morgan, Helena, Alabama and Kelley B. Howard and her husband, Greg of Huntsville, Alabama; five grandchildren: Nicholas and Marsena Morgan, Chad and Melissa Gwathney, and Kaden Howard; one brother, James B. Strickland, Jr. and wife Shirley, and many nieces and nephews. Growing up in small country Alabama towns such as Pine Apple and Carlowville, Jimmie was a class leader, beauty queen, and cheerleader. In 1954, she married city boy, Clifford Bradford. Throughout their married life they lived in Camden, Alabama; Troy, Alabama; Hampton, Virginia; Fort Walton Beach, Florida; Cape Canaveral, Florida; Houston, Texas; Huntsville, Alabama; Robertsdale, Alabama; Calera, Alabama; and Montevallo, Alabama. Jimmie was a dedicated Christian, wonderful wife, and fabulous mother and Granny. She was a loyal friend, Sunday School teacher to young people and women, WMU leader, and Vacation Bible School Director. Her many talents included being a decorator, cook, seamstress, wedding planner, marathon runner, Appalachian Trail hiker, and antique and junk collector. Jimmie was a true Southern Belle with a memorable Southern drawl. Jimmie loved the color yellow, so consider wearing some yellow, if you so choose. In lieu of flowers, memorials can be made to Alzheimer’s of Central Alabama, your favorite charity, or church. A special thank you to the loving and caring management, residents, and staff of Plantation Manor Assisted Living and the Plantation Manor Nursing Home.